Your kitchen cabinets aren’t just about function – they’re also the main design element in your kitchen. From the line and form of your cabinets to the type of wood you select, your cabinets are a reflection of you and your lifestyle. When you choose Fahy Kitchens for your cabinetry needs, you’re choosing a team of highly-trained experts whose main goal is to help you find just the right cabinets for your lifestyle and your budget. We believe in good relationships – with you and with our manufacturers. That’s why we only carry two lines of kitchen cabinetry from non-competing producers, so we can offer you a wide range of choices. 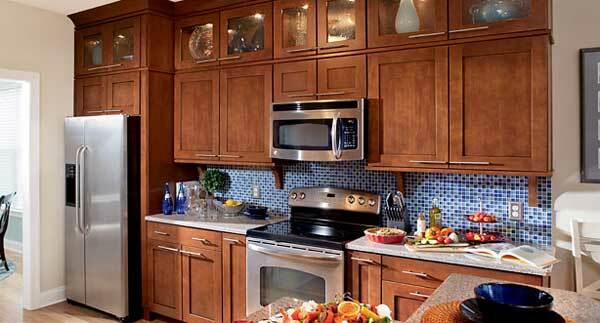 If you’re looking for good quality cabinetry that’s also a good value, we carry Timberlake Cabinetry. Timberlake offers three lines of kitchen cabinets: Value Built, a combination of quality craftsmanship and affordability; Portfolio, finely crafted with a broad range of style choices and upgrade options; and Portfolio Select, top-of-the-line cabinetry which provides the style, quality and features found in expensive, custom-built cabinetry – for less. With Timberlake, you also have a broad range of wood options – choose from painted maple, maple, oak, cherry, hickory and thermo foil. Or, choose Dura Supreme brand cabinetry, offering three lines of the finest quality cabinets available. Their Crestwood Cabinetry line provides exceptional value and exceptional design, coupled with a thoughtful balance of materials, construction and styling options. Or, choose Dura Supreme’s Designer Cabinetry series, which is the epitome of the cabinetmakers’ craft with an emphasis on form and function. For sleek, modern design, artistic details and many custom options, Fahy Kitchens proudly offers the Alectra Cabinetry collection from Dura Supreme. With so many options available, we know it can be difficult to choose the perfect cabinetry to suit your style and budget. That’s why Fahy Kitchens offers full design services. Please contact us or call us at 315.735.8181 today to schedule a consultation – we’ll be more than happy to assist you in creating the kitchen you’ve always dreamed of.